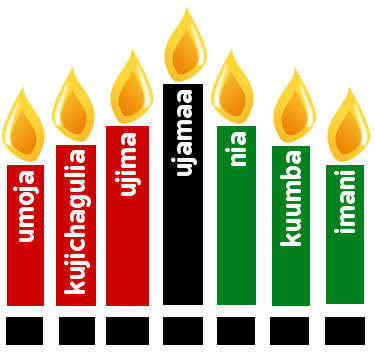 Two evenings ago, on Saturday, we gathered together with family and friends to acknowledge the start of Kwanza. It was a beautiful night of music and laughter and connection. My sister-in-laws brought cupcakes and my mother’s sweet potato soufflé. Our longest friend and her husband drove down from Hartford and made collard and kale greens. I cooked mac-n-cheese, corn bread pudding (my middle daughter insisted), lamb roast, and a huge pot of turkey necks (made the way my mother loved them) with noodles. Another friend made rice and peas (she is like a sister to me), and we had homemade pound cake for desert. We had beer and wine and sparkling cider, and a 103-song Mp3 disc my youngest brother made before driving down from Bridgeport. In total, there were 30 of us, including neighbors, nephews, cousins, and long time friends. It became an multigenerational mix. My two remaining brothers were there. The youngest guest was only a few months old; the oldest is turning 80 in January. Every decade in-between was represented, each at different stages in their life journey. My wife added her own wisdoms about love and responsibility. She mentioned the pallor of race which dominated so much of 2015 and will again as the election nears. “But,” she reminded, “we have always been stronger than that.” It became a special moment, and our candlelit home glowed with satisfaction as we lit the black candle at the center of our kinara. Later, my wife gave every family a African American-themed calendar for our Zawadis or gifts. As we lingered well into the evening, I thought about my students and wondered how their holiday was progressing. I had to admit I missed them, and my colleagues, and I would enjoy returning to school almost as much as I relished the time away. When my school reconvenes, it will be 2016, and my seniors will be entering the countdown stage. We still have much to cover: two novels, poetry, grammar reviews, sixty more vocabulary words, several formal papers, and one thing more. I still have to reinforce my life lessons about stamina and character and courage and faith. I still have more stories to tell. The open eyes around it feed a teacher’s ego—that special passion and fear teenagers feel on the brink of adulthood. I want so much for them. I know time and life will test their swagger, but I also know a nurtured spark will rarely fade. So we have this time left together to prepare for our goodbyes. This weekend, I still have midterm exams to grade and a few late papers, but I will not start that until tomorrow. I just didn’t feel like assessing earlier in the week. I have four days left before class resumes; I will mark the work and find a way to encourage–especially the struggling ones. For now, as the New Year saunters in, I just want to cherish the journey thus far. I want to thank God for all my blessings, for my family, for my friends, for my mind, for my loves. I want to wish all of you a marvelous year of exploration and depth. And I want to embrace all the students I have taught (over 1200 at last count) then and now, and I want to thank them for enduring all my well-intentioned anecdotes and jokes. I want to thank them for listening– and laughing back. This entry was posted in Uncategorized and tagged Kwanza, senior year, Winter Break. Bookmark the permalink.